Do you like Rivieras? So do we. Glad you found us! There's something about these cars that commands attention, don't you agree? Whether it's performance, style, luxury, or history, Riviera is one of those cars that stirs passion and captures interest. Maybe it's the unique details that you just don't see in most cars nowadays. Maybe it's the sleek, muscular shape. Maybe you secretly enjoy when people stop to look at your car, even say "Wow!" Ever been mistaken for a Jag or a Rolls? Yep, we know - happens all the time. Riviera by Buick has always been a car that exudes class, yet it doesn't go over the top with unneeded adornments or impractical features. The interior is simple, the seats are comfortable, and the build quality is respectable (it's not uncommon to see a 200k mile Riv in fairly decent condition). Riviera also has a powerful street presence, with unmistakable style and supercharged performance to back it up. Riviera Performance is the place for folks who truly love Rivieras. Whether you enjoy driving, tinkering, modifying, racing, or just learning more about these cars, you've come to the right place. Our goal is to compile and organize information about Rivieras in an effort to help fellow enthusiasts build, repair, and modify for better performance. We can help you keep your car running well for years and years, build a tire smoking monster from the ground up, or upgrade handling capabilities to make your car a formidable road handler! And it's not just about making power and going fast. Performance can mean anything that keeps the car running stronger, more efficiently, even improving the style. Some of our members enjoy seeing how many MPG these cars are able to attain. Some of us want a specific style for the exterior, even creating body kits for a custom look. We also invite all car-related discussion, and we'd like to see pics of your Riviera if you have one. Post them up in our Showroom! Most of our knowledge and focus relates to the later model Rivieras with 3800 V-6, but we're always looking to grow. If you own a classic Riviera, or one from any year, we'd like to hear from you and learn more about your car. Anyone with an interest in Rivieras is welcome to join and post in our forums. Together, we aim to become the ultimate Riviera resource! Thanks for visiting. We look forward to meeting you! If you haven't already registered, it's free, and in doing so you will have access to our tech forums. Also, this enables you to post questions to the membership. Click the "Register" tab above or this link to get started - it only takes about a minute. Already registered? Congrats! Please enjoy using the site's many resources, and maybe contribute some of your own automotive knowledge to the forums. One thing before you begin posting topics: read this important message on Getting Started (click). Thanks again, and hope to see you around! Just giving this a bump for the flood of new members. ...otherwise known as rural nowhere. To blog members, Hello and a big thumbs-up for the incredible stuff you do to upgrade and preserve Rivs. I own a rebuilt '97 and am just a bit partial to the last-gen years. Mine is a daily driver with 100K on a standard 3.8L dropped in from an '02 LeSabre, and a rebuilt trans with 60K on it. The rest of it has over 220K with the usual maintenance stuff done and it is still one solid ride at a very low price. I'm just a driver, not a mechanic, but I know enough to do a little maintenance on it, or to drool over what y'all do to yours. Wish I could upload a pic of my bronze '97, but don't have a website to post it to first. Not many Rivs out my way, but if you're the guy in Ness City with a red last-gen, NICE ! Looking forward to learning from you or just enjoying the news! Just signed in. Got a 1982 Riv in Michigan am working on. Have a couple questions for the group. Hope for some comments . Thank you so much everyone. Greetings all! I'm Dave. I don't personally own a Riviera, however, my mother does.It's a 1982. The colour is Jade Green I believe. I recently had to move back in with her, so I'll be the hands that steer the comeback. She was parked next to a building that was aflame. Many of the plastic exterior parts melted. Working on replacing what I can. I look forward to reading and finding out as much as I can about this little beauty. Hi, I finally got me a Riviera! I’ve loved the Riviera design and style since it was born in 1963. 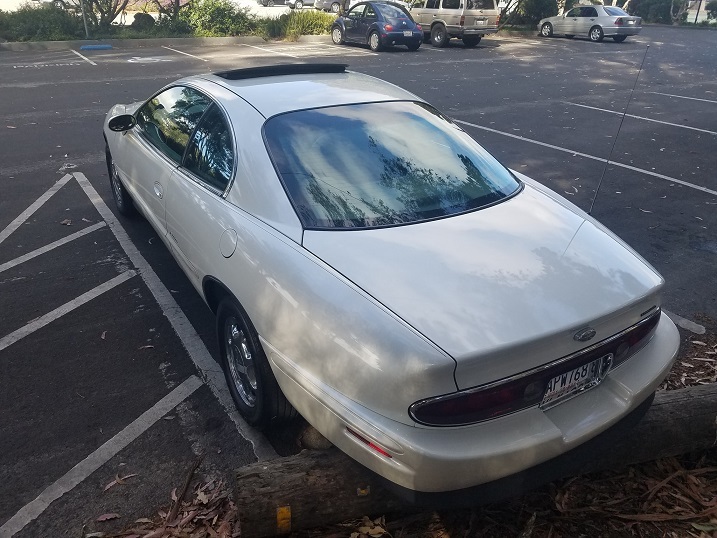 I just purchased a 1997, supercharged, diamond pearl white, pretty much loaded, Riviera with only 58k miles. I bought it from the original owner who always kept it in the garage in Arizona. The car looks awesome and I am loving life!!! I changed all the fluids, installed a few new gaskets on the engine. It’s my new daily driver. I think I want to be buried in this one!! it costs less than a casket does these days!!! LOL. PS - how do i post some pictures for all to enjoy? Moe, you posted on the Announcement page (you're not the only one). Create a new post in the "Welcome" section so people will read it! Thank you for the add. I have loved these cars since my aunt bought a 63 Riviera when I was a kid. I remember seeing the last generation on a turntable at a auto show and thinking I wanted one someday. Well I found a great example. A 1997 owned by a Grandma who died and the family found the car in the garage. They didn't even know she had it. I has 39 thousand miles on it. I am very happy with it. Nice, i'm sure you will enjoy it. A bonus it only has 39k on it. Drove her home from WA 3 weeks ago to her new home in SoCal.. A Vegas run and a Central Cali run complete (~3300 miles) with the only qualm being the car put my companion "to sleep".